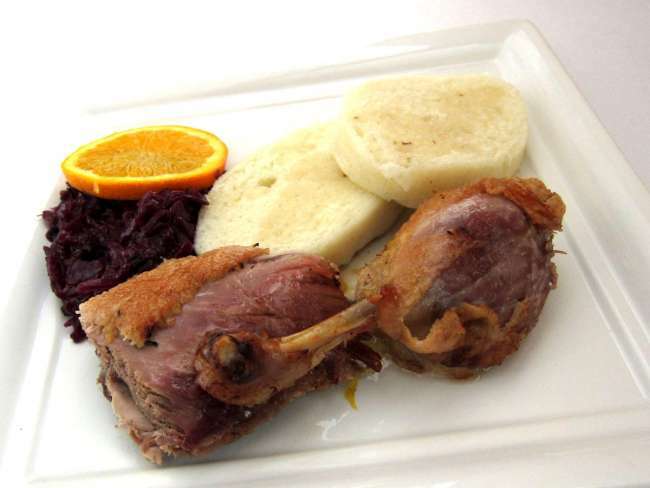 One day before baking wash fresh or defrosted duck and season well with salt the inside and outside. Place it in the cold place. The day when the duck is roasted remove it from refrigerator 3 hours before it is served and rinse it under cold running water. Put it into a deep pan, slightly brush with salt and ground white pepper. Put in duck cavity two peeled oranges. Pour water in and roast the duck covered for 1 hour in the oven at medium heat. Prepare marinade from orange juice, honey and ground ginger. After one hour take the duck out of the oven, turn it over and spread marinade over it. Continue roasting covered for 1 more hour and regularly, after each 20 minutes, turn it over, spread marinade over it and, if needed, pour water in. The last half an hour of roasting uncover the baking pot, again spread over the marinade and roast at high temperature. Turn it in the middle of the high temperature roasting and marinate it. Do not forget to control temperature, if it is too high honey will burn. Allow the roast duck to cool a bit, remove oranges from the cavity - they cannot be consumed anymore. Cut the duck into portions and serve.